Justice, Dignity, Hope, Equality, Collaboration, Tenacity, Appreciation, Respect, Empathy and Forgiveness. What a powerful set of words. 100 illustrations by Rosemary Cunningham for the #100daysofherstory challenge. © Rosemary Cunningham 2018. Illustration, etc. 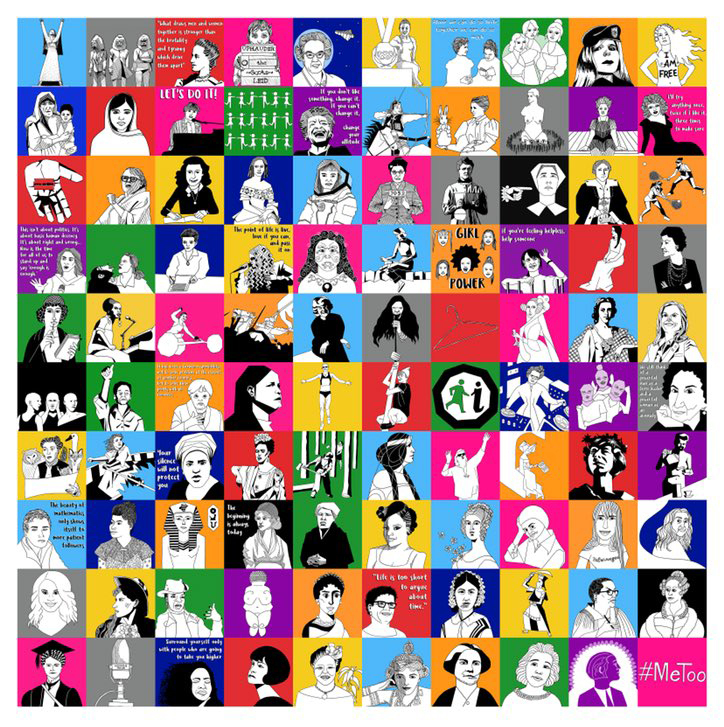 Firstly, I spotted that illustrator Rosemary Cunningham shared her completed set of #100daysofherstory portraits, a creative challenge she set herself to learn about and celebrate the role of women. For the last year I have followed some of the progress of her challenge and each time one popped up in my Instagram feed, it was inspiring to discover a new colourful portrait and a nugget of the history about these important female figures. It was also refreshing to see how the communication of history and stories of people can be approached in new ways on social media. Something we are often trying to do from our Museum social media accounts. So following International Women’s Day 2018, I set myself a micro-challenge: to head out into the National Museum of Scotland and search for objects by women artists or designers. I’ve opened it up to include designers, as I studied design at art school and always like to find inspiring examples from both fields. So I started by taking a walk around our Art, Design and Fashion galleries and Scottish History and Archaeology galleries, firstly looking for pieces that I liked the look of and then peering closer at the label to find out who they were made by. I was familiar with a number of these artists, but I’ll humbly admit there was an equal share which were completely new discoveries for me. So, in answer to the National Museum of Women in the Arts… here are my 5 favourite pieces by women artists and designers on display at the National Museum of Scotland. Blown Away Jar. Designed by Elizabeth Fritsch, London, 1990. A.1990.137 On display in the Making and Creating gallery at the National Museum of Scotland. 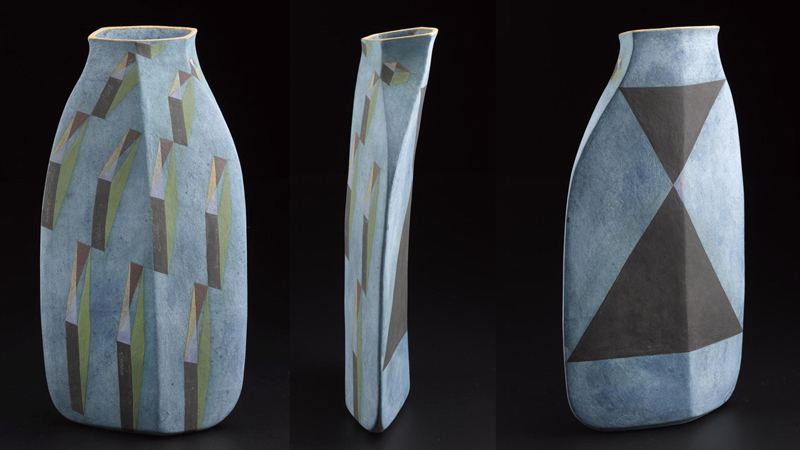 Elizabeth Fritsch has been a leading figure within ceramics since the 1970s. This piece of her work proudly sits in its own case in our gallery at the National Museum of Scotland. It’s best to walk a full circle around it to fully appreciate its tactile, unusual form, appearance and stunning geometric decorations. Fritsch seems to have work in a vast selection of National and public collections in the UK, and worldwide, with great examples to be found in the online collection of the National Museum Wales and The Fitzwilliam Museum. Left: ‘Universe’ fifteen part blown and lampworked glass sculpture. Designed by Wendy Ramshaw, London, 2007. K.2007.326. Right: Brooch of silver and white enamel. Designed by Wendy Ramshaw, London, 1972. A.1973.68 Both pieces are on display in the Making and Creating gallery at the National Museum of Scotland. Upon discovery of Wendy Ramshaw’s work, I’ve fallen hard and fast for it! I bet I’m not the first – these pieces on display have a fresh, modern feel and yet there are throwbacks to history. The familiar shapes and crisp lines draw the eye, but then the further detail explodes. 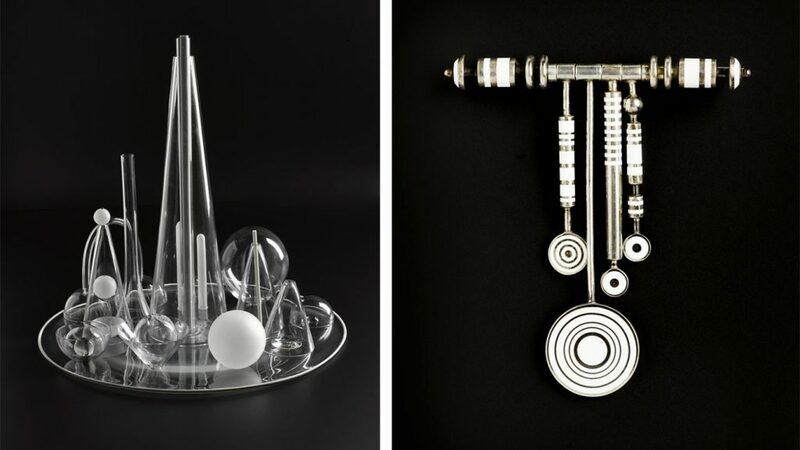 Wendy Ramshaw is a champion of modern jewellery design and there are lots of further examples of Ramshaw’s work in the online collection of the Victoria and Albert Museum, London, the British Museum, London, and National Museums Scotland, Edinburgh. Aurinko, printed textile sample. Designed by Vuokko Eskolin-Nurmesniemi, Helsinki, 1964. A.1979.197 On display in the Making and Creating gallery at the National Museum of Scotland. 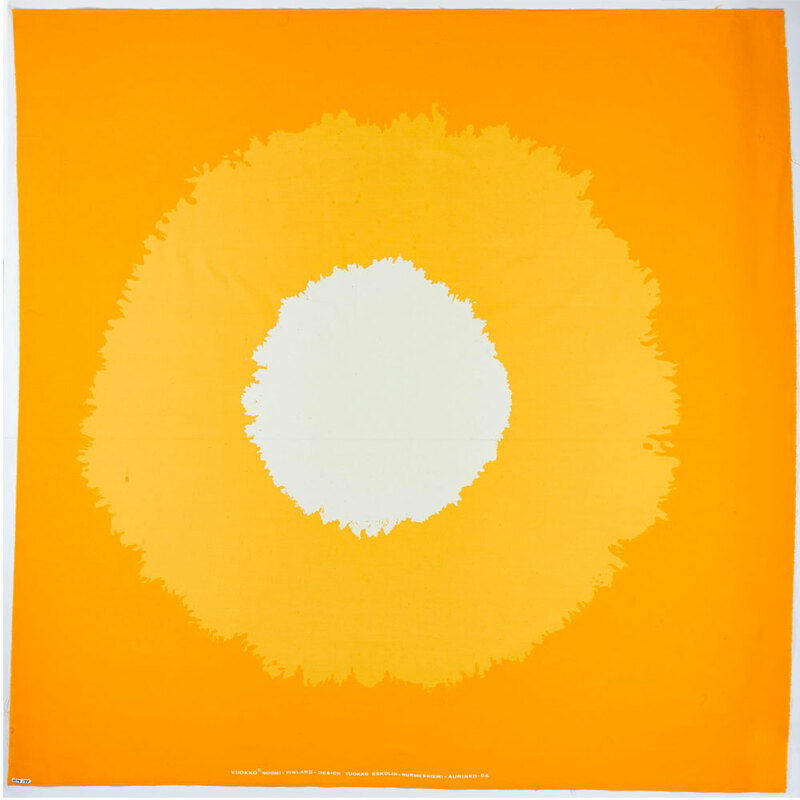 Glorious yellow, one of my favourite colours, abounds in this bold printed textile designed by Vuokko Eskolin-Nurmesniemi. A pioneering textile designer, Nurmesniemi is responsible for many of the designs for the renowned Marimekko brand, where she was a lead designer. 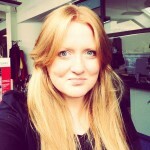 Subsequently, she also founded her own companies. A number of pieces of her work are shown in the online collection of the Metropolitan Museum of Art. K.2014.19. Screen printed cotton fabric, Herb Antony. 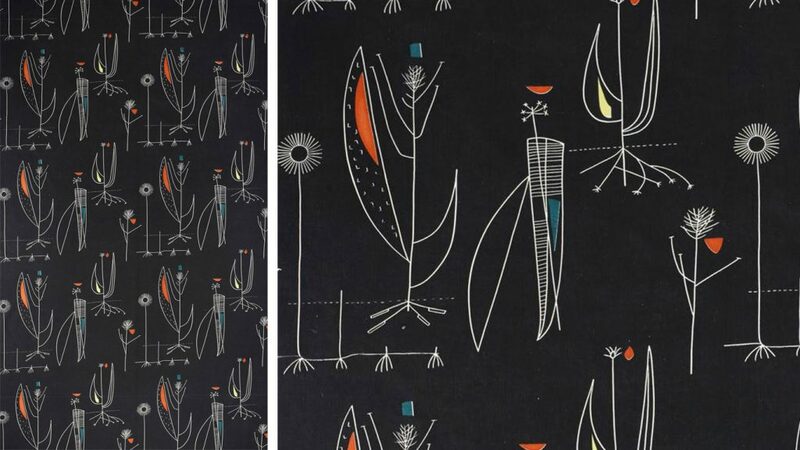 Designed by Lucienne Day, made by Heal Fabrics, British, 1956. On display in the Making and Creating gallery at the National Museum of Scotland. This colourful textile design is by Lucienne Day, and I really like the sense of hope it embodies. The abstract but floral motifs have an optimistic, spring-like feel to them – with a sense of something growing and forming. Lucienne was a true pioneer in textile design in Britain, with a career spanning several decades. After finding this piece in National Museums Scotland’s online collection, I’ve subsequently scrolled through the decades of colourful images on the Robin and Lucienne Day foundation and discovered her Decoy and Pond series of silk mosaics in the Victoria and Albert Museum collection — I adore the pixelated, graphic style of them. K.1998.1794 The Corryvrechan Tapestry. Designed by Kate Whiteford and hand-woven by the Edinburgh Tapestry Company, 1997. Acquired with the aid of the Scottish Council National Lottery Fund. On display in Hawthornden Court, in the Scotland galleries at the National Museum of Scotland. 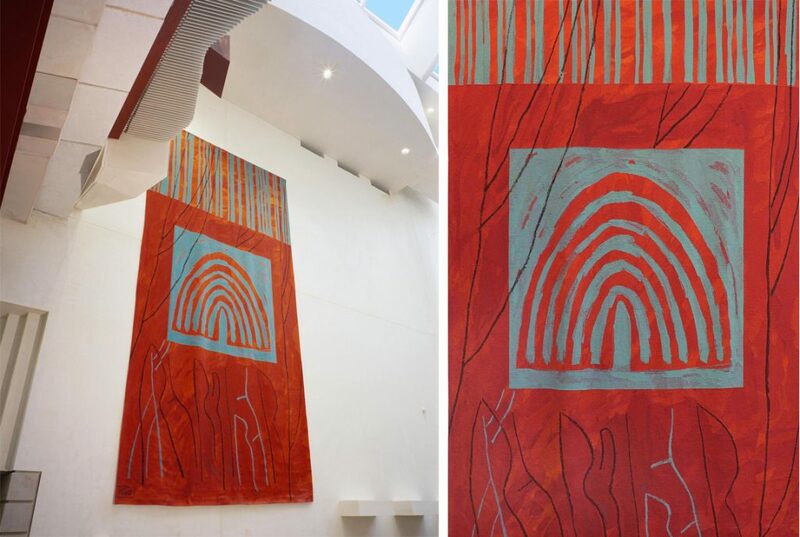 The Corryvrechan Tapestry by Kate Whiteford adds a striking artistic element to Hawthornden Court. I’ve passed this many times, but it wasn’t until I stood directly below it and looked up that I really felt the power of this vivid red giant or realised that it was by a woman artist. The colours really look more like they have been splashed on energetically with paint than carefully woven into place. Kate Whiteford is renowned internationally for her large-scale paintings and installations. The Corryvrechan Tapestry was Whiteford’s first work in this medium. Her work is represented in many major public and private collections, and she has received many awards and honours, including an OBE in 2001. I’ll admit that it has been quite hard to choose just five favourites. The stunning Summer panel by Margaret Macdonald Mackintosh, giant embroidery by May Morris and Theodosia Middlemore and the extensive collection of pieces by Phoebe Anna Traquair certainly deserve (probably much more than), a mention. There are so many exquisite details in this gesso panel by Margaret Macdonald Mackintosh. Each time I’ve looked, I’ve seen something different and these details all combine to make a powerful piece, that stands proudly in the Design for Living gallery accompanying work by Margaret’s husband and creative collaborator, Charles Rennie Mackintosh. I’m certain that if I walked around next week, I could easily pick a different set of favourites or that other pieces might catch my eye. However, it’s been good to educate and inspire myself a little further and I would certainly encourage that next time you are at the National Museum of Scotland to try the same challenge! Tate: What does it mean to be a woman in Art?